RIPLEY, W.Va. — At the local Fourth of July parade, Alex Mooney proudly showed off his West Virginia concealed gun permit. The Republican&apos;s campaign colors are blue and gold — echoing the Mountain State’s flagship public college, West Virginia University. 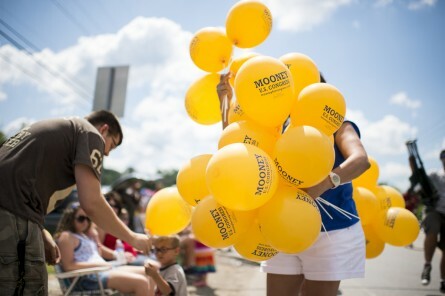 In a gold polo shirt, Mooney pointed to his son sporting a WVU baseball cap, standing near the campaign&apos;s pickup truck stuffed with gold balloons. In a place with a lot of Mountaineer pride, Mooney has outdone them all. Here&apos;s the issue: Mooney isn&apos;t from West Virginia. He graduated from Dartmouth College in New Hampshire, and until early 2013 , he was the chairman of the Maryland Republican Party. This November, Mooney will face off with former West Virginia Democratic Party Chairman Nick Casey in the race to succeed Rep. Shelley Moore Capito, who is running for Senate. He&apos;s already battled accusations from Democrats that he&apos;s a carpetbagger. Mitt Romney won the 2nd District with 60 percent and the race is rated Leans Republican by the Rothenberg Political Report/Roll Call. Mooney&apos;s move-arounds have made the contest more competitive. West Virginia boasts outsized state pride, and many local and national Republicans are concerned about the GOP’s ability to hold the seat in November. "I believe that it&apos;s a likely Republican seat," Mooney told CQ Roll Call. "I believe that my positions on the issues are where the voters stand." Mooney accuses Casey of unmitigated support for President Barack Obama. But Casey, who also marched in the Ripley parade, laced into Obama. "When the president was running, he sold hope and sunshine to the nation," Casey said. "Look what happened since he was elected. ... He didn&apos;t bring hope and sunshine to West Virginia. What he kind of brought was a fear of job loss." 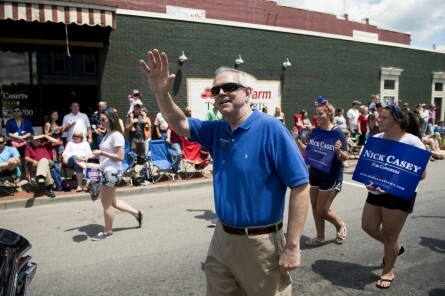 At the parade, Casey seized every opportunity to showcase how many people he knew in the crowds and display his deep ties in the district that runs from state capital, Charleston, to the Washington, D.C., exurbs. He mentioned he played little league with Capito&apos;s husband. The campaign&apos;s parade ride? It&apos;s a black Chevelle on loan from Darrell Pritt of Campbell&apos;s Creek, and Casey has been buying from his tire shop since his parents introduced them. "It&apos;s really to be hard to imagine that [Mooney] could be successful running against me, when I know every third person in line at the Ripley parade," said Casey, who also said Mooney&apos;s organizational success in the GOP primary won&apos;t translate to November. In that crowded May contest, Mooney made the case that he fled Maryland and "came to West Virginia to live in freedom," according to his campaign ad. Mooney, a former member of the Maryland legislature and a protege of ex-Maryland Republican Roscoe G. Bartlett, might have had a shot at replacing his former boss. But Democrats redrew Maryland&apos;s 6th District to be more favorable to their party following redistricting, and Democrats picked up the seat in 2012. In college, Mooney ran for a state House seat in New Hampshire, making West Virginia the third state where he&apos;s sought public office. Mooney is patient with the carpetbagger charges. He argued in previous interviews that the region he represented in western Maryland shares a border and many other similarities to West Virginia&apos;s 2nd District. And, underscoring that West Virginia is now home, he said last week that he intends to buy the house he is renting. "It was brought up many times in the primary," he said of the accusations. "Voters had other issues that were more important. It&apos;s obviously a distraction." Part of Mooney&apos;s problem is the woman he&apos;s seeking to replace. Capito&apos;s constituents are on a first-name basis with her. She is known to skip her flights home and make surprise calls on constituents on the six-hour drive from Washington, D.C., to Charleston, W.Va. But many voters at the parade said they knew little about the race to replace the congresswoman and even less about Mooney. Physician recruiter Brenda Greene, a registered Republican, weighed in when informed of Mooney&apos;s recent arrival to her state&apos;s politics. "That bothers me," she said. "Unless they were from here originally and left ... but if they&apos;re coming here just to get a seat, just because this is the place to come to be able to bump somebody out, that&apos;s not the right mind set to be running for political office. " So far, Mooney has surprised state Republicans with his work ethic. His primary win was no fluke; he ran the best campaign. More importantly, his WVU colors gambit worked. As he worked the crowd on the parade route, a woman snapped a photo of him with her daughter. West Virginia has welcomed outsiders before. Most notably, retiring Sen. Jay Rockefeller, D-W.Va., who was born in New York City. But some West Virginians remain dubious of Mooney. "Rockefeller was different, I think, because for a lot of West Virginians, it was a point of pride because of our reputation," a West Virginia state Republican operative said. But Mooney will have the vote of the state&apos;s most prominent Republican. "It&apos;s going to be a tough race," Capito said of the contest for her district at the parade. "I think the state is trending more Republican because folks are concerned about the direction of the country." She said, "I&apos;ll be voting for Alex Mooney." Related Stories: Shelley Moore Capito Campaigns Amid Father&apos;s Complicated Legacy &apos;Nicky Joe&apos; Bets Political Survival on His Local Brand Senate Hopefuls Work Parade Route in West Virginia NRCC Reserves $30 Million for TV Ads in 2014 Tea Party Candidate Wins Republican Nod for Capito Seat Get breaking news alerts and more from Roll Call in your inbox or on your iPhone.